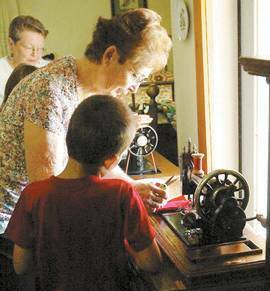 LEARNING…Mary Burrows shows Luke McDaniel the treadle sewing machine at Pioneer Day Celebration. This year’s celebration will be held Saturday, September 10th. The annual Pioneer Day at the Cheyenne City Park this year will have new and exciting events for the entire family on Saturday, September 10, 2016. At 9:00 am, a program will begin in the Park Pavilion by the Cheyenne High School Band and Vocal Music Departments. At 9:30 am, the activities will be in full swing on how to quilt a block plus a Quilt Show, a Scavenger Hunt for the children sponsored by the Western Plains Library System, kneading homemade bread, churning butter and embroidery. Kids are sure to enjoy the craft corner where they can make a rag doll, a rope, and play old time games – sponsored by the Girl Scout Troop. You can also make hand-cranked ice cream for all to enjoy.